Sony FDR-AX1 can record 4K 60 fps movies at its full resolution and even moving subjects it shoots look extraordinarily smooth, sharp and true to life in playback. For the AX1, a variation on XAVC has been developed called XAVC / S, which differs from XAVC is it uses GOP codec of H.264/AVC for video file compression. This codec makes XAVC S video not an easily editable format for FCP, iMovie, Avid, etc based on many users’ experience. So quite a few guys still think it is necessary to convert 4K XAVC S to ProRes even for Final Cut Pro10.1.1. "I have a sony 4K FDR-AX1 and a TV 4K Sony. The images 4k on the TV set after editing with Final Cut are not good. Shall I convert these XAVC s codec to pro res 422?" If you have large amount of 4K 50p XAVC clips, the 4K XAVC to ProRes conversion cannot be avoid. Conversion is easy with lots of options, such as the built-in Log and Transfer function with FCP 7. However, the output quality, the video resolution, the frame rate and the conversion time are the really crucial points you care about. Aunsoft iMedia Converter for Mac is outstanding for solving the problems you really cares about before editing 4k XAVC in FCP. You can easily achieve 4k to 4k, as well as 4k to 2k when converting 4K XAVC S to ProRes. Besides the frame rates you can select are from a widely range, including 23.976, 24, 35, 29.97, 30, 50, 59.94 and 60. As we know, different 4K camcorders record various formats, such as MXF, MOV, MP4, AVCHD, etc. The iMedia Converter for Mac, as a multiple supported converter, can successfully convert 4k MXF to ProRes, 4K MP4 to ProRes, 4K MOV to ProRes, etc. 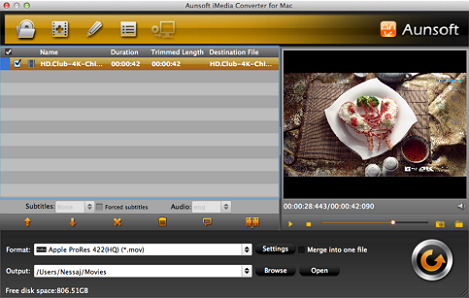 More than 50 types of input formats and output formats make it possible to handle almost all kinds of video conversion. Below is a simple tutorial to convert 4k XAVC to ProRes 422 for FCP X 10.1.1. With the advanced HD XAVC encoding technology, the 4-steps conversion process is time-saving and easy-to-handle. Click "add video" or "add folder" to load your source XAVC S videos from XQD cards. You can also drag & drop directly. Click the "format" and choose the "Final Cut Pro -> Apple ProRes 422 HQ(*.mov)" files as the output format for FCP. 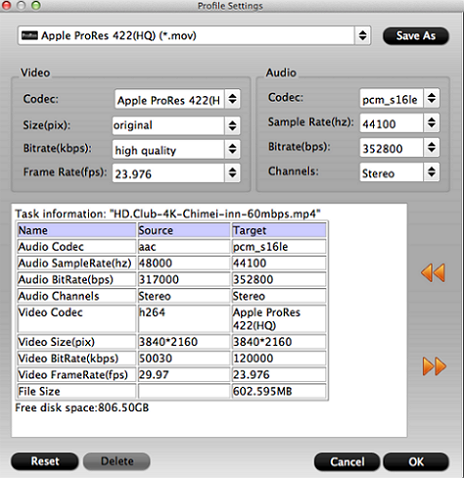 Apple ProRes 422HQ codec offers the utmost possible quality from XAVC recordings. Here you can set video size as original to keep 4 k resolutions. And your can also adjust bitrates, frame rate, resolution, aspect ratio, sample rate, channels, etc. Click "Conversion" icon, iMedia Converter for Mac will start to convert 4k XAVC S to 4k Apple ProRes for FCP X immediately. With just a click on "Open output folder", you can locate the export MOV easily. Final Cut Pro X: More Complex or just More Professional?